Its been a funny old few days, and sometimes I have to laugh otherwise I would have to take some things far too seriously. For instance, I laughed when Sally came back from the shops with three brand new pans. Followers of this blog will know that our kitchen is a veritable graveyard for anything that is likely to be a vessel for Sally’s culinary delights, but in this instance I had to ask, ‘What about the old pans?’ She had to admit that she did not know what I was talking about, so I lifted out the tub that contains rice, quinoa and pasta, and lo and behold, there were three brand new pans. ‘Those are my nice copper pans, they are not for cooking with,’ she replied. ‘So why are they hidden away?’ I asked, at which point I decided that future debate was pointless. I contented myself with an inward smile, knowing that the three newest pans would soon end up in that non-stick graveyard in the sky, whilst the copper ones, that had previously looked on enviously as their distant stainless steel cousins boiled and steamed all manner of comestibles, now realised that they were fortunate to be pretty enough to just sit there on display (albeit at the back of a dark space!) without risking incineration. I went back to work, getting a lift of Michael Glover, but more of him later. After a few hours in the office I realised the importance of keeping my leg horizontal, and at the end of the day it was sore and stiff as I settled in to an evening at Roomzzz. Of course, a bit of forward planning and a trip to Sainsbury’s meant that I was self sufficient, knocking up a very nice curry and rice on the hob. Yoghurt and blueberries with a dash of honey for dessert, and it was almost as good as being at home. Of course, another good thing about being in a hotel room is that even if you wanted to snack, the effort involved in going out and finding something would be too much to contemplate. After another two days at work I got a lift back home again, thankful that I could then rest for a few days. In another triumph I started cycling again. I’ve been to Tesco and back several times, and once to Buxworth, but its not really the time of year for this, and I have taken to wearing two pairs of gloves to go with my lycra. I had to laugh last Friday, when I couldn’t find my phone. I rang it, and although I knew it had full charge the answering service told me that I wasn’t available. Hmmm, that means that it is somewhere that does not get a signal. Buxton perhaps? Now what would my phone be doing in Buxton when I am clearly in Whaley bridge. This mystery was soon resolved when I rang Sally. ‘No, I’ve not got your phone. Only mine. And my work one. Why have I got a missed call from Sarah…oh, this must be your phone.’ She then claimed that I summoned her back from Buxton, but I will let you make your own mind up about that. It is the cricket club AGM next Tuesday, and that means the Secretary’s Report. Our secretary is notorious for the length of his prose, and recently he has taken to including quotations for effect. Now, I have no problem with this, in fact a flowing narrative can be rewarding to both read and write. Unfortunately, Mr Crowley seems to delight in using words that are not, shall we say, every day ones, and when a reasonably intelligent person has to look up the meaning of some of these words, then the average Whaley Bridge Cricket Club Cricketer will either dismiss it along with the rest of the report, or worse misunderstand it, thereby diluting the efficacy of the message (sorry!). The effectiveness of a man of letters is constrained by his ability to use the correct spelling and grammar, and when using quotations it is simply unforgivable to mix up the surname of the author of the quotation with that of both the second team player of the year and the chairman of the club, which obviously renders that quotation useless, whilst at the same time casting doubt on the credulity of the remainder of the document. Zac’s butterfly knife arrived, and although it is perfectly safe it looks and feels impressive. He was at a sleepover on Friday, and he was desperate to take it with him, and of course it is perfectly safe so we agreed. He came home from school with his mate Alex, and then they they had to head off to the shops for supplies for the party. They returned, and got ready to party, at which point we noticed that Zac’s rucksack looked rather heavy. Ignoring this I dropped him off, pointing out to Helen, the hostess of the sleepover, that the knife that Zac had with him looked lethal, but it was perfectly safe. The following morning all was well, but Helen had a couple of things to hand over. Firstly, the knife. Although it was perfectly safe Helen thought it best that it didn’t fall into the wrong hands so she confiscated it. She confiscated several other things, including two full cans of Monster Energy drink, which explains why the bag was so heavy. ‘We only had a sip at a time,’ Zac claimed. More detailed searches will be carried out in the future. I made chicken fried steak last week – very tasty it is too! I even used my meat tenderiser which makes a huge difference, turning ‘casserole steak’ into tender strips. The process is fairly simple. Dredge the meat in spiced flour (I added 12 different herbs and spices – more than KFC), dredge it in egg wash, then dredge it in the flour again. Shallow fry for about 3-4 minutes on each side then drain on absorbent kitchen paper. Definitely one for MMM…No2…Cookbook. Heading off to Nottingham I also made chicken and vegetable soup that passed Sally’s taste test (it was better than cabbage water), pork in ginger, and meatballs in bolognese. Not much left when I got back last night! Of course, not everyone is a fan of this preparation, in fact Sally frequently complains that there is too much food in the house, and if it wasn’t there she wouldn’t eat it. Then she bought me a new baking tray. ‘You can make biscuits on it,’ she explained. I had to laugh. Last week I had to remind Zac that you are what you eat. If you eat rubbish it will turn you into a couch potato. In a related matter, every morning is an adventure when it comes to Zac’s bag. I take out the previous day’s lunch box and replace it with today’s fresh offering. On Tuesday, just before I set off for Nottingham, I found that Monday’s apple was untouched, but a Galaxy bar wrapper was there. I left him a note reiterating that he needed to eat healthily and he would have to forfeit his X-Box for leaving the apple. I spoke to him later that night, at which point he tried to complain. ‘You are what you eat you said. If I eat carrots I’ll end up like a carrot.’ Not quite sure he understood what I meant. The phrase ‘couch potato’ was also thrown into the conversation, so I just asked him why he didn’t eat his apple. ‘Did you put apple in there?’ he asked. ‘I wasn’t very hungry at school.’ Hardly surprising given the empty Galaxy wrapper! Going to see The Stranglers in Nottingham in March. Can’t remember the last time I saw them, but the first time was almost 40 years ago! I wonder if they will remember the words? Michael Glover is very excited about the prospect. 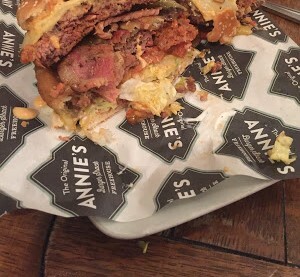 I wonder if Annie’s Burger Shack is also on the cards. Spam seems to have taken an odd direction since Christmas. As well as the Nigerian Generals and well meaning American benefactors, I’ve now been offered an online degree, miracle slimming pills, and perhaps most bizarrely a field light that is bright enough to blind a bear. I kid you not. Bright enough to blind a bear. What a selling point! Perhaps I will dedicate one of these blog entries entirely to Spam. I certainly get enough of it. Finally, I had to laugh. You may recall that I had to have stomach injections post op, and now we have a container full of discarded needles. These specially made containers, ‘Sharpsafe’ or something like that, hold the needles until they can be properly disposed of. ‘You can drop them off at the doctor’s in Whaley when you go,’ Sally said. A couple of hours later the needles were back in their original place, on the side in the kitchen. ‘You didn’t take the needles,’ she complained, but I pointed out that I did indeed take the needles. Unfortunately, the doctor’s do not take needles, and if they did it would have to be at Chapel, and even then they would only take needles that they had actually given out. I would have to take them to a hospital, and preferably the one that originally handed them out. ‘That’s ridiculous,’ said the ex nurse. ‘I’d have thought that someone who works in a hospital would know the procedure for disposing of needles,’ I said, which it could be argued was somewhat inflammatory. ‘So, do you know anyone who is heading off to a hospital any time soon?’ She ignored me as she put on her coat and went off to work at Wythenshawe Hospital. I had to laugh.